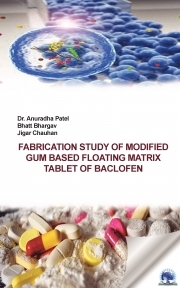 Description of "FABRICATION STUDY OF MODIFIED GUM BASED FLOATING MATRIX TABLET OF BACLOFEN"
The current book emphasize on prepare, evaluate and optimize modified gum based floating matrix tablet of baclofen. The purpose of the book is to enlighten information on post graduate students regarding modification of natural gums and Formulation of floating matrix tablet of baclofen. The book also covers various fabrication studies on matrix tablet to characterize the optimized floating matrix tablet for drug content and drug release. The information provided includes formulation and evaluation of floating matrix tablet of Baclofen by using carboxymethyl tamarind as matrix forming polymer. Optimization was done using 32 full factorial designs. From the polynomial equation and contour plots generated, both independent factors showed significant effect on dependent variables.The sustained release of Baclofen was observed and good fit to Higuchi model was demonstrated. The optimized batch shows all criteria within specification. The practical concept and information will be beneficial to the entire research scholar interested in such field of studies. Pharmamedix India Publication Pvt. Ltd. Reviews of "FABRICATION STUDY OF MODIFIED GUM BASED FLOATING MATRIX TABLET OF BACLOFEN"